Survived. Just barely. No thanks to AT&T, who, in their classic brilliant style, decided to transfer my landline to my empty new apartment two days before they were supposed to, leaving me with no Internet access (I had DSL) and no home answering machine for the weekend. Iâ€™m on dial-up for the next couple of days, till my new cable modem gets installed. I got about eight hours of sleep spread out across the last three days, and I think I lost 10 lbs. in 48 hours from the continuous stairclimbing. But Iâ€™m here. And the cats seem to be finally calming down a little. They were tharn for the first 24 hours and once they ventured out of their carriers Mr. Blue kept hissing at Kiwi like heâ€™d never seen him before. But last night they turned the corner, I think, and are starting to realize that they have not been delivered to the Land of Dragons. Yet. The prior tenant left a few things behind in the kitchen, including a half-full carton of eggs. However â€” and this is why I love my neighborhood â€” they were cage-free organic eggs. So all right, then. For that I’ll overlook the Grape Nuts in the pantry. Mister. Also, if you live in Chicago and you need movers, book USA Moving and Storage. Don’t even consider anyone else. DJs Dave & Kristine recommended them and they were stunning. I’ve used professional movers five times now and USA Moving and Storage were the first company that didn’t try to deceive, shortchange, bully, or intimidate me in any way. Just four amazing guys who cheerfully worked at lightning speed â€” it was almost surreal to watch them move, like a speeded-up film sometimes. My brother-in-law and I stood watching one guy wrap up large furniture items in protective plastic, and it was like watching a spider wrap up a fly in its web, only faster. Anyway, did I link to that wonderful Chicago moving company USA Moving and Storage? Here, let me link to them again. Just don’t book them the same day I’m moving next time, because I’ll throw myself out a window if they’re already booked solid when I call. And let me reiterate the moral of the post from yesterday: Don’t give AT&T any more power over your life than you have to. I’ve long wondered whether DSL or cable modem is the better choice â€” many considerations both pro and con for each â€” but this past weekend answered that question for me. 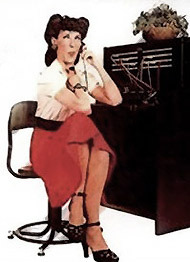 Because if your phone line gets arbitrarily taken away due to a bureacratic screwup by a huge, arrogant corporation that doesn’t have to provide good customer service because, as Lily Tomlin used to say, we’re the phone company â€” well, in that case, you’ll lose your Internet connection, too. And The Phone Company will gladly keep you on hold for 45 minutes of mobile phone time, when you should be packing because the movers are coming tomorrow, and then spend another half hour of your desperately needed time cheerfully refusing to resolve your problem or do anything to make up for how badly they’ve screwed up your life, or even admit that the problem is entirely 100% their fault with no collaboration on your part. And the next time you call them to try to resolve a problem, after they’ve refused to help you they’ll end the call by trying to convince you that you should order even more “services” from AT&T â€” give them power over your long distance service and Internet connection and lord knows what else â€” so they can arrogantly and unapologetically screw you over in those areas of your life as well. I only have AT&T for my land line now, and I think I’m switching to RCN for that, too. AT&T is a money pit. (I hesitate to ditch the land line altogether, since I’ve had that number for nine years and my cell reception is still so patchy.) But I can get a bundle deal if I go through RCN (I have cable and Internet through them already). Hmm … well, I do think RCN is at least a few degrees less evil than AT&T. On the other hand, the post above is a classic example of why I try to avoid “bundling,” or any situation where I get more than one service from the same provider. Because if something goes wrong with your account for one service, whether it’s a glitch of some kind, or you just get behind on the bill because it’s one of those months, then suddenly you can lose the other services as well, all in one swoop. You wind up losing your mobile service and your landline at the same time, or maybe your landline and your Internet access, or any of several other fun combinations. So, better to spread out those services as thinly as possible, say I. Insulates you from the bureaucratic bullying and incompetence ever so slightly. Maybe worth looking at some of the other local service providers besides RCN? I am just posting to salute your use of “tharn” which delightfully sent me back to Watership Down, with echoes of a hrududu in my head . . .
Hey, TomD! Nice to know I’m not the only Lapine speaker around these parts … praise to great Frith! That sounds inspired. I’m looking forward to it, but for now I’m off for an evening silflay. Oh please oh please — post it. I have lived almost 768 months and this is the first time I’ve even HEARD of lawn Ornament Theater. I’m so glad I didn’t leave this life before now. I even grew up in a part of the country that SHOULD have had L.O.T., but maybe all those BVMs in upended bathtubs painted blue inside slaked our innate thirst for theater. Plus we had the Bay State Drive-In. I will hold my breath until I turn as blue as the interior of the one heading east on Rt. 44 out of Putnam Connecticut, and then will breathe out the wish for you to post this. Please? Go bunnies! P.S. I haven’t forgotten you and will call. Thanks (about the email problem).